This adorable little free-standing cottage is located on scenic Shore Road (Rt. 6A), close to Bay beaches and Atlantic ocean beaches. 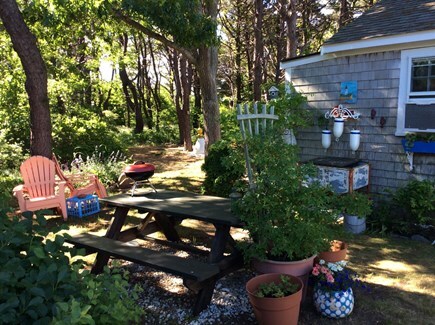 Small but fully equipped, charmingly decorated with a French Bohemian flair, pretty flower gardens, picnic and sitting areas, outside shower, has off-street parking, and is on the Provincetown shuttle route. 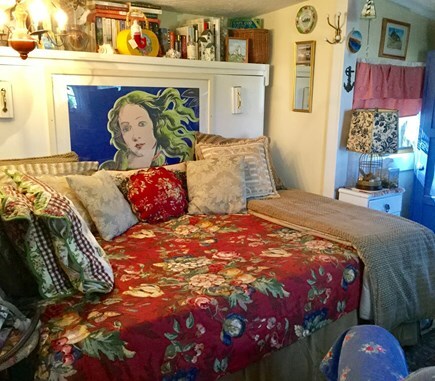 Looking for a quiet place to get away by yourself to unwind, write or create your art, this comfortable little cottage is ideal for the single traveler, safe, quiet and cozy. Also a perfect little romantic hide-away for two, it is an open floor plan cottage, with combined kitchen and living room area with a cathedral ceiling in the living room section. 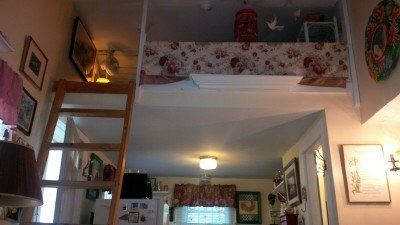 Over the kitchen area is a sleeping loft reached by a ladder. With a queen size bed, the loft is such a cozy retreat, or use the cozy sleeping alcove (double) on the ground floor in the living room area. Amenities include cable TV, Internet, and an outdoor shower. 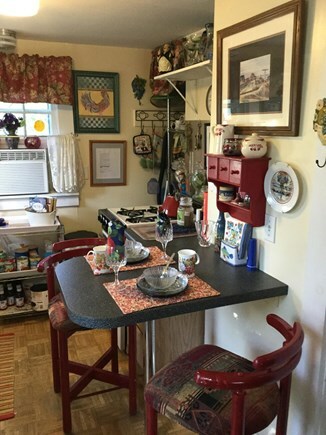 Located in a cottage colony of 15 other cottages, all cottages are separate with their own yards, and they are individually owned but share 3 park-like common acres. A quiet, safe environment for adults, away from the noise and bustle of P'Town but close enough to enjoy the shopping, restaurants and nightlife of Provincetown. *** sorry no pets during July and August. The cottage was small but thoughtfully and beautifully furnished to maximize the available space. There were many amenities included that made our stay most enjoyable. If the weather had cooperated, we would have been able to enjoy the grill, picnic table and outdoor seating as well. The cottage was very conveniently located close to beaches, restaurants and shopping. Thank you, Lynda. It was a pleasure to have you as a guest in our cottage. So sorry the weather didn’t cooperate. You will have to return and we will put in a request for more sunshine from the powers up above. We really enjoyed our stay at this tiny cottage. The location is perfect for the activities we prefer . I suggest that you bring only the essential items you may need as there is more than enough things taking up any extra space. Carole is lovely to work with. A cottage where you spend most of your time outside in the lovely yard. 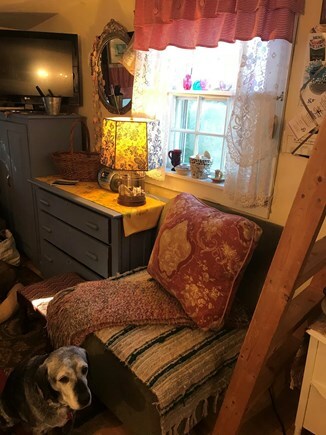 Lovely little cottage, eclectic decor with all sorts of interesting chachkas (you can tell the owner runs a fun antique shop), tiny, cute, very cozy! Comfy bed + furniture, fully equipped, and nicely located for bike rides to beach or to P-Town. Highly recommended! We definitely hope to return. Thank you, Will. We love sharing our little Bohemian hideaway with our guests and hope they enjoy their stay. 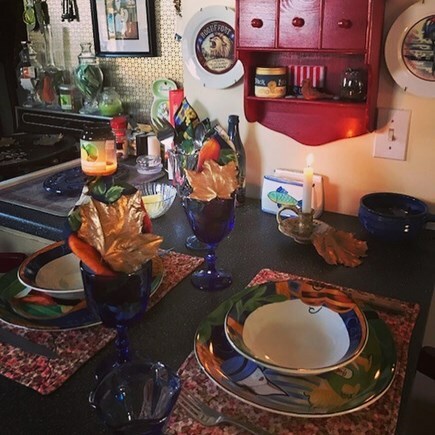 Yes, I do borrow some special things from our antique shop to decorate with or for our guests to use and enjoy at the cottage. I have fun getting creative and changing things up each season. Thank you, Colleen. We enjoy sharing our cottage with our guests and hope to make their stay comfortable and enjoyable. The shuttle is great. We use it all the time to go into Provincetown, no hassle or expense. Due to a cancellation, we were very lucky to get in for a week in July. 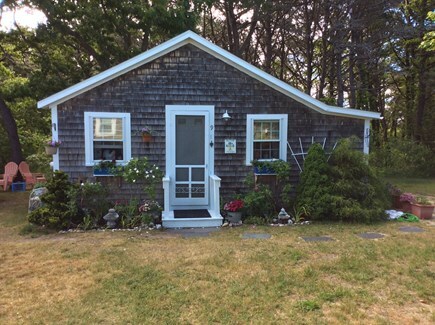 This cute little cottage is located close to some of the finest beaches in the USA.The cottage is tucked in the back of this little summer community and has all you need, A/C for those hot nights, an outdoor shower (a MUST on the Cape) and minutes from the ocean or bay. No. Truro is perfect; quiet and away from the hubbub of the Lower Cape and close to Wellfleet and P-town. 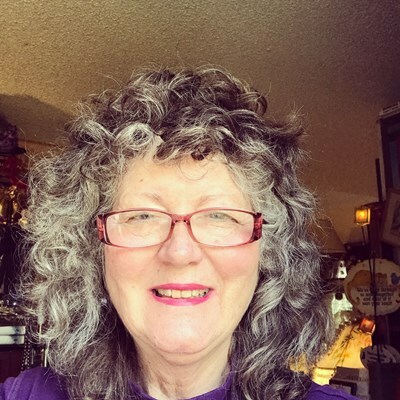 Carole is the wonderful homeowner and will do everything she can to make sure you have a lovely stay. Thank you, Jim and Anne. We enjoy sharing our little piece of paradise with our guests and hope all our guests return home well rested and with great memories. Great little cool cottage. Nice small community of friendly people. Perfect location! Thank you, Sharon, for your review. We are so glad you enjoyed your stay at our cottage. We spent a week at this Cape Cod cottage in June 2017. The place could not have been more perfect, from the location in Truro to the interior amenities and decoration. It was fully equipped with anything you would need. 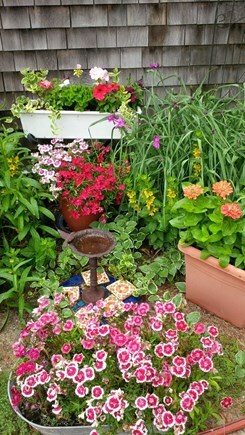 The outside was both relaxing and had beautiful plantings to enjoy. It is ideal for two people. 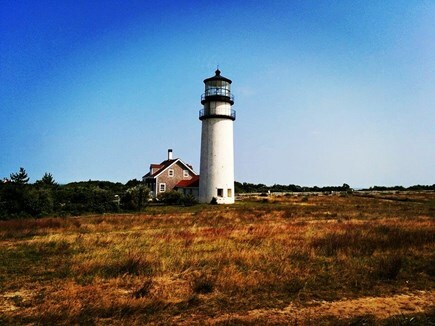 Beaches were not far away and it is also a short drive to P-Town with all it has to offer. 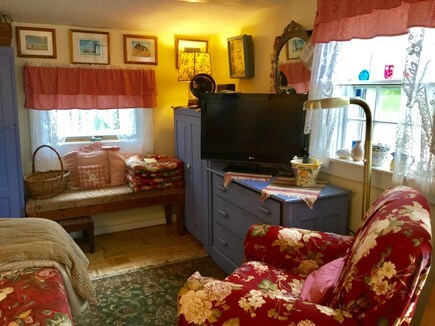 We highly recommend this "Cape Cod Cottage in Truro." 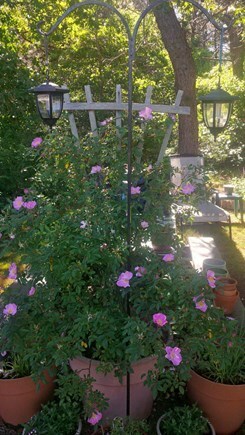 We have owned our little North Truro cottage for 13 years and have vacationed in Truro for several decades. We love Truro because of the National Seashore beaches, preserved open spaces, and it's rural character, it really is ''Ole Cape Cod''. Unhurried, nature at it's best, inspiration for artists and writers. Our little romantic Bohemian hide-away is quiet and tranquil just perfect for 1 or 2 people. We enjoy sharing our little piece of paradise with our guests. Our cottage is a quiet special place in a wooded setting away from the road and the hustle and bustle of town. We provide many special touches to make it feel like home, lots of books, and board games for lazy afternoons. Furnished with some antique pieces from our Connecticut shop, local artwork, and a fully equipped kitchen. Small but comfortable. 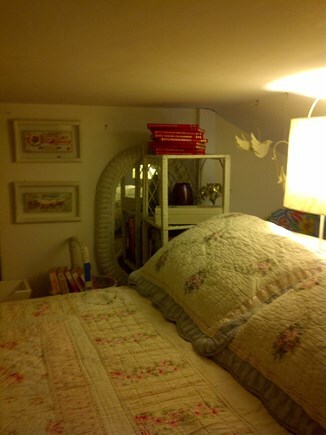 1st floor sleeping alcove or loft sleeping area. Nice outdoor picnic area, flower gardens, outdoor chairs, small deck in back under the trees as well as yard area to enjoy. Some of our past guests have been writers and artists who come to work in the quiet and gain inspiration from the beauty all around us. Many have stayed with us while they are taking art courses at the Castle Hill School in Truro or participating in writing programs in Provincetown. Truro is very special and unique, located next to quirky Provincetown, at the tip of the Cape. Truro is a very narrow strip of land and you are always close to the water. 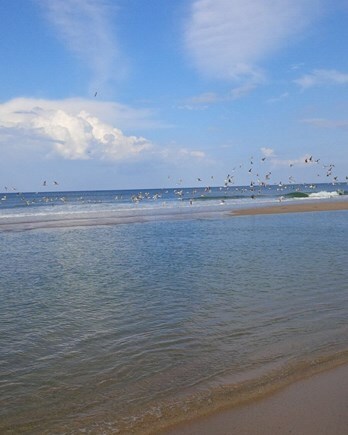 There are so many beautiful close by beaches to visit, we are 4/10th of a mile from the nearest Bay beach, entrance just down the road next to the Top Mast Resort or just about a mile to the wild Atlantic Ocean side beaches. Whatever your fancy is , swimming, sunbathing, fishing, beach combing or walking in solitude along the shore, we have over a dozen close by beaches for you to visit. A photographers' and artists' paradise. Just a couple of miles away from Provincetown's world-class restaurants, art galleries and quaint shops. 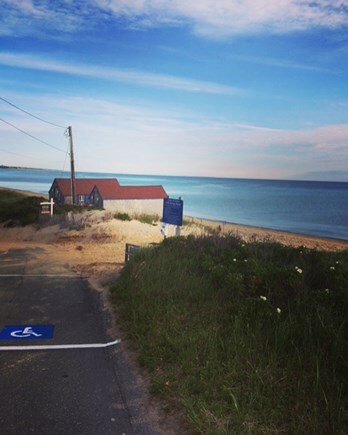 The Provincetown shuttle runs right in front of our colony in season to take you into Provincetown, day and night, no parking worries when you take the shuttle. Runs every half hour.